James Dean was an American movie actor whose premature death in a car crash cut short his career at the age of 24. He began his acting career with appearances in television shows and commercials. However his enduring fame and popularity are due to his starring roles in just three films, Rebel Without a Cause, East of Eden, and Giant.. He is the first actor to receive an Academy Award nomination for Best Actor posthumously and he remains the only actor to receive two posthumously. James Dean has a few U.S. presidential kin including Richard Nixon, Millard Fillmore, Calvin Coolidge, Franklin D. Roosevelt, and Gerald Ford. Famous literary kin include Louis L’Amour, Ralph Waldo Emerson, Ray Bradbury, Tennessee Williams, Thomas Pynchon, and Louis Auchincloss. 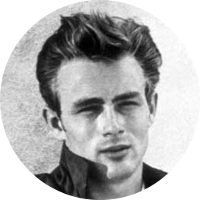 James Dean also has a few famous historical figures in his family tree including convicted witch Mary (Perkins) Bradbury, signer of the Declaration of Independence Samuel Adams, and astronaut Alan Shepard. His kinship to other celebrities include Christopher Lloyd, Anthony Perkins, Humphrey Bogart, Halle Berry, Lucille Ball, Bette Davis, Christopher Reeve, and Linda Hamilton.